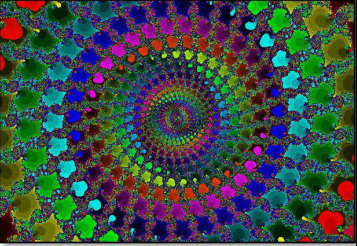 In Nottale's theory, called scale relativity, the underlying fractality of space-time is most noticeable in the quantum world. Quantum behaviour, he claims, can be understood geometrically - particles move along fractal trajectories. On large scales, his model could explain a fractal pattern of the galaxies. The most profound question in physics today is how to unify the really small with the really big - and when it comes to matters of scale, fractals may turn out to be a key ingredient. (Mpc/hr = megaparsecs per hour. Cosmology is founded on the assumption that when you look at the universe at the vastest scales, matter is spread more or less evenly throughout space. Cosmologists call this a "smooth" structure. But a small band of researchers, led by statistical physicist Luciano Pietronero of the University of Rome and the Institute of Complex Systems, Italy, argues that this assumption is at odds with what we can see. Instead they claim that the galaxies form a structure that isn't smooth at all: some parts of it have lots of matter, others don't, but the matter always falls into the same patterns, in large and small versions, at whatever scale you look. In other words, the universe is fractal. Fractals allow Pietronero to paint a very different sort of picture - one in which the irregular distribution of matter that we see around us never evens out into a smooth structure, but repeats itself at ever grander scales. Fractals are familiar enough; we see them in the branching of trees, the curves of coastlines, lungs, turbulence and clouds. No matter what scale you look at them, fractal patterns look the same. Think of broccoli; a tiny branch looks much the same as the whole vegetable. Zoom in or zoom out, the structure looks the same - exquisitely detailed, never smooth. Fractals can be beautiful to look at, but when it comes to galaxies it may be a subversive kind of beauty. "When you're looking at the size scales of galaxies, groups of galaxies, clusters, superclusters and filaments, it looks like a fractal," says Hogg "but once you get larger than all of that, then it starts to look homogeneous." What has convinced him is his team's analysis of the latest data from the Sloan Digital Sky Survey, the largest 3D map of the galactic universe so far. His team insists that the map is proof of smoothness. The fractal camp, however, are sceptical. In fact, they say the Sloan observations confirm what they've been claiming all along. "We argued every day about fractals." Hogg says. "Those battles raged over lunch and coffee and finally convinced us by the end of our visit that we should be doing the analysis as they say." When they returned to the US, Hogg and Eisenstein applied the fractal team's methods to a sample of 55,000 luminous red galaxies mapped by Sloan. They found that the galaxies do form a fractal pattern, but as they looked at bigger and bigger scales, the pattern appeared to disintegrate and smooth out at just over 200 million light years - a scale far larger than most cosmologists had expected. But Pietronero and Sylos Labini are not convinced. Instead, they believe that if astronomers could continue to zoom out and look at even larger scales, they would find more clustering. They suspect that the apparent smoothness at 200 million light years is not real, but rather an illusion created by statistical effects due to the limited range of the Sloan survey. Hogg's team, though, insist that their evidence of homogeneity is statistically significant. "I think the result really is secure." says Hogg. "I would stake my scientific reputation on that." Even if the result is real, mainstream cosmologists still have a huge problem on their hands. The fact that the fractal patterning extends to far bigger scales than anyone had expected means that there must be far bigger structures than anyone expected - structures that are even bigger than superclusters. The fractal team argues that the standard model cannot explain the existence of these galactic giants. "If you look at the galaxy data, you can see enormous objects hundreds of millions of light years across, stuff that's really huge." says Pietronero. "This is a huge problem. You're going to have to change the story very radically." According to Pietronero, there simply hasn't been enough time since the universe came into being 14 billion years ago for gravity to sculpt structures larger than about 30 million light years across: expansion would have prevented anything larger from forming. "The existence of structures much larger than this implies a crisis of the present view of structure formation." he says. This present view is the "cold dark matter model", in which the glowing masses of stars and galaxies are only the tip of the cosmic iceberg. Luminous matter makes up roughly 15 per cent of all the matter in the universe - the other 85 per cent is mysterious ‘dark matter’. Hogg's team says that the new observations do not undermine the standard view as Pietronero claims. Instead, they maintain that the cold ‘dark matter’ model explains the Sloan data quite accurately. For that to be true, however, Hogg's team have to put a number called a bias parameter into their equations. It reflects the difference between the distribution of matter in computer simulations of the cold dark matter model and the observed distribution of luminous matter. Collisions between particles of ordinary matter help it clump together, but dark matter is thought not to behave in the same way. That suggests it could be spread out in space more evenly than ordinary matter, so cosmologists assume that the distribution of the matter we can see - galaxies, say - is not a true reflection of the distribution of all the matter that is out there. They believe the structure of the universe is really much "smoother" than it appears to be, because dark matter dominates. In the case of the Sloan survey, the bias is 2; the visible galaxies are clumped twice as densely as the predicted total distribution of matter in the universe. Sylos Labini, however, sees the bias as a fudge that allows cosmologists to discount the observed clustering of galaxies and to assume that the gigantic clusters of superclusters are only half the problem they appear to be. "The bias is a way to hide the size of structures behind some ad hoc parameter." he says. Mainstream cosmologists, however, feel the bias is justified, assuming that galaxies cluster in regions of space that are replete with excess dark matter. According to the standard model, dark matter is everywhere, but galaxies only shine in the rare regions where dark matter is densest. Dark matter also lingers in the voids where no light shines but here it is thinly spread out. In other words, while the luminous galaxies look very clustered, the underlying blanket of dark matter is far smoother, supporting the claim of homogeneity. "If the cold dark matter model is correct, then there should be dark matter in the voids." Hogg says. The million-dollar question is: what is the real distribution of dark matter? Is dark matter smooth or fractal? Is it clustered like the galaxies, or does it spread out, unseen, into the great voids? If the voids are full of dark matter, then the apparent fractal distribution of luminous matter becomes rather insignificant. But if the voids are truly empty, the fractal claim requires a closer look. "The universe is not a fractal," Hogg insists, "and if it was a fractal it would create many more problems that we currently have." A universe patterned by fractals would throw all of cosmology out of the window. Einstein's cosmic equations would be tossed first, with the big bang and the expansion of the universe following closely behind. Hogg's team feel that until there's a theory to explain why the galaxy clustering is fractal, there's no point in taking it seriously. "My view is that there's no reason to even contemplate a fractal structure for the universe until there is a physical fractal model." says Hogg. "Until there's an inhomogeneous fractal model to test, it's like tilting at windmills." Pietronero is equally insistent. "This is fact." he says. "It's not a theory." He says he is interested only in what he sees in the data and argues that the galaxies are fractal regardless of whether someone can explain why. As it turns out, there is one model that may be able to explain a fractal universe. The work of a little-known French astrophysicist named Laurent Nottale, the theory is called "scale relativity". (see "Fractured space-time" - in left column).